Oil on canvas transferred from panel, 47 x 50 cm. On Judgement Day, the Virgin Mary prays – or intercedes – for humanity with her son, who has also shown his willingness to sacrifice himself. Mary is able to intercede on behalf of others because she is both human and the mother of Christ, which makes her divine. The clear colours are a trademark of Bout’s painting style. Christ and the Virgin Mary are both depicted with a softness that harmonises well with what a private devotional image is (andachtsbild). 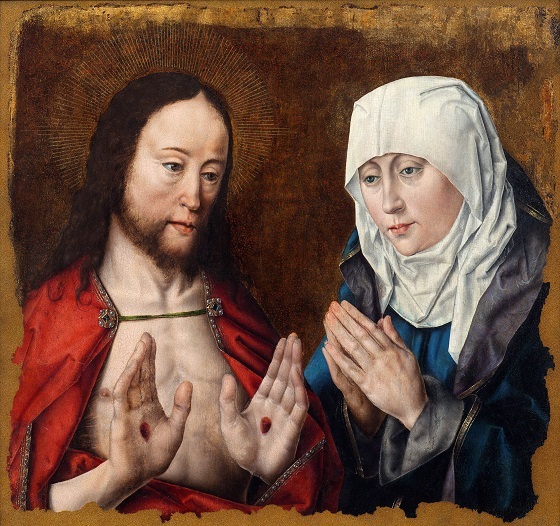 The artist was clearly inspired by two of the greatest Dutch painters of the 15th century, Rogier van der Weyden and Hugo van der Goes. This is especially reflected in the Virgin Mary’s physiognomy.